Our hotel is designed for all who prefer quiet and cosy place to stay with an individualistic atmosphere, different from large anonymous hotels. HotelAD Puk is located in a peaceful part of the Beroun's centre in a reconstructed secession building in the Kostelni Street No. 4. 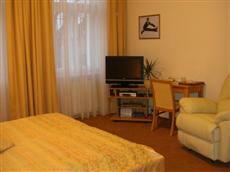 The hotel offers luxury accommodation in eight apartments. It has an original name of the apartments after the Olympic cities which are connected with the successes of the Czech hockey team. Six of them (Grenoble, St. Moritz, Sarajevo, Albertville, Innsbruck and Sapporo) are more than 30m2 large double suits. The last two apartments have both two bedrooms and they are designed for the most demanding customers and they are about 100m2 large. The attraction of Albertville is the photography of the crucial Czechoslovak national hockey team's match in the course of the Olympics in 1992 with the hotel's owner on it. The real pride of our hotel is the garden embraced by pair of city walls which serves as a perfect relaxation from the daily bustle. There are also other facilities available such as whirlpool, outside arbour with fireplace and barbecue set.